Open the PowerCenter - Source Analyzer. Click Sources > Import XML Definition. Click Advanced Options. The Change XML Views Creation and Naming Options dialog box opens. Configure all options and click OK to save the changes. In the Import XML Definition dialog box, navigate to the xsd file. Click Open. The XML Definition Wizard opens. Verify that the name for the XML definition is good, and click Next. Select the XML definition creation option. If you only need to work with a few elements and attributes in the xsd file, you can skip creating a definition using the XML Wizard. Instead, you create a custom view in the XML Editor. With a custom view in the XML Editor, you can exclude the elements and attributes that you do not need in the mapping. When you skip creating XML views, the PowerCenter - Designer imports metadata into the PowerCenter - Repository, but it does not create the XML view. 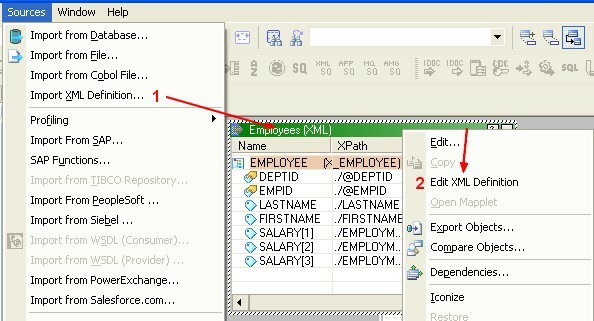 You have to use the PowerCenter - Xml Editor to add groups and columns to the XML view. Double-click the XML definition or right-click the XML definition and select Edit XML Definition to open the PowerCenter - Xml Editor. In the menu, Click XMLViews > Create XML View to create a new XML view. 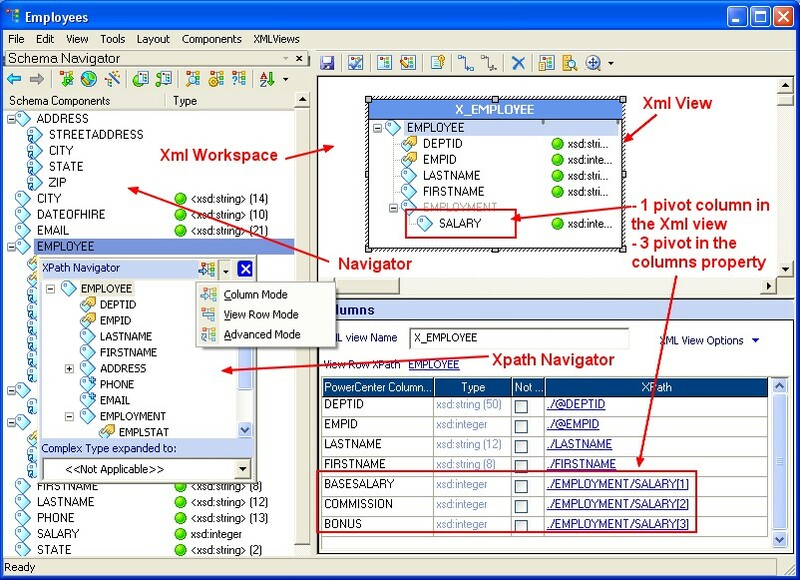 To pivot a column, click the Mode icon on the XPath Navigator, and choose Advanced Mode. Drag the column into the new XML view to create the pivoted columns. Click File > Apply Changes to save the changes to the view. Click File > Exit to close the XML Editor. The modified source definition appears in the Source Analyzer. The pivoted columns do not display the names you entered in the Columns window. However, when you drag the ports to another PowerCenter - Transformations, the edited column names appear in the transformation. Click Repository > Save to save the changes to the XML definition.